When Alisa Bair got an email from the Hillary Clinton campaign about a contest to meet the presidential candidate at George and Amal Clooney's home, she entered on a whim. After all, her daughter Lauren, an actress, lives in Los Angeles, and it would be a way to spend some time with her. Alisa didn't give it much thought until last Sunday, when she learned she would be joining Clinton at the Clooneys' in just six days. Clearing their schedules, Alisa, a freelancer writer and composer, and her husband Rob, a retired high school counselor-turned landscaper, planned their trip from Lancaster County, Pennsylvania, to California. "Lauren and my daughter Leslie had a lot to say about what I would wear," Alisa says with a laugh. And her star-studded evening turned out to be "unforgettable and incredibly special," she tells PEOPLE exclusively. On their way to the Clooney residence, Alisa notes that they saw protestors who were "quiet, well-behaved." The Secret Service was a big part of the evening, of course, with "a dog sniffing the car and agents checking your ID several times, making sure you're on the list." Fonda then invited Ellen DeGeneres and Portia di Rossi over to meet the Bairs, along with the other contest winner and his brother. "Ellen was just hilarious, as always," says Alisa. And Fonda, "looked fantastic." 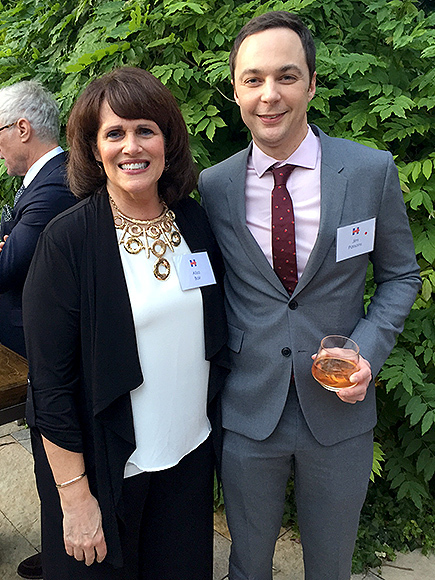 And the Bairs were especially excited to meet Jim Parsons. "We are such Big Bang fans so right away I went over to take a picture with him," says Alisa. "We've watched every single episode." "We were very attuned to what her schedule has been over the past week," adds Rob. "The debate, she did various roundtables, an event in San Francisco, all the news coverage. It's amazing." "All her staffers say she's totally up to this. She's just a super woman. And I kind of believe it, looking at her," says Alisa. "We asked her how she was doing and what she does to refuel and she said, 'I do like everybody else, I take a walk, I watch mindless movies to kick back.' "
"We got to talking about the Amish. Everyone asks us about the Amish, being from Lancaster County." "Comparing to what you get to know about somebody through the filter of the media, I just felt her to be more gracious," says Rob. "Softer," adds Alisa. 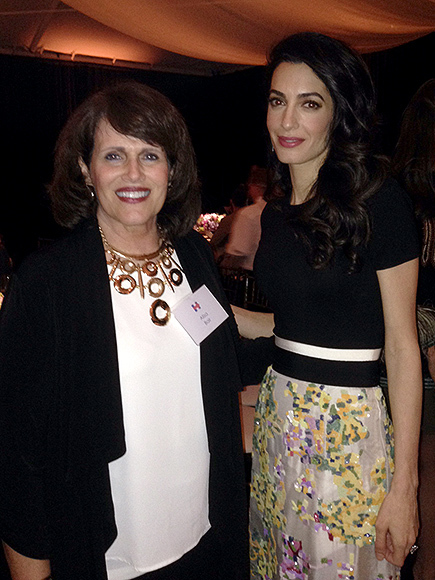 "Talking with Amal … Amal is the classiest person in the world, I think. That British thing, and she's so intelligent, my gosh," says Alisa. "And then George goes, 'Hey, Pennsylvania!' "
"Just so fun-loving and a down-to-earth guy," says Rob. "I'm not sure if I kissed him or he kissed my cheek, but I said, 'This is from several hundred women,' or, what did I say?" "This is from all the women in the world," her husband offers good-naturedly. "He was just laughing." "Everyone's like that with him, I'm sure," says Alisa. 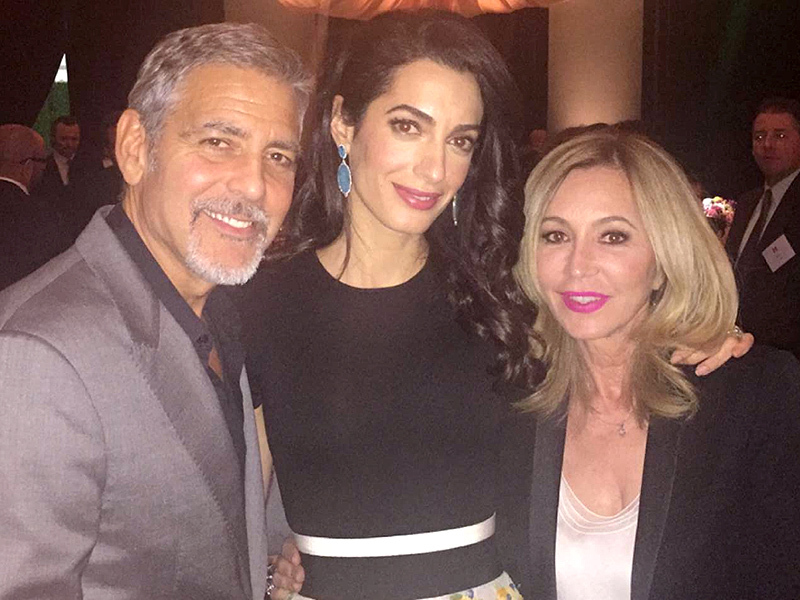 Well, for one, Beverly Hills aesthetician Anastasia couldn't help but Snap a photo of her own evening with the Clooneys (see below). 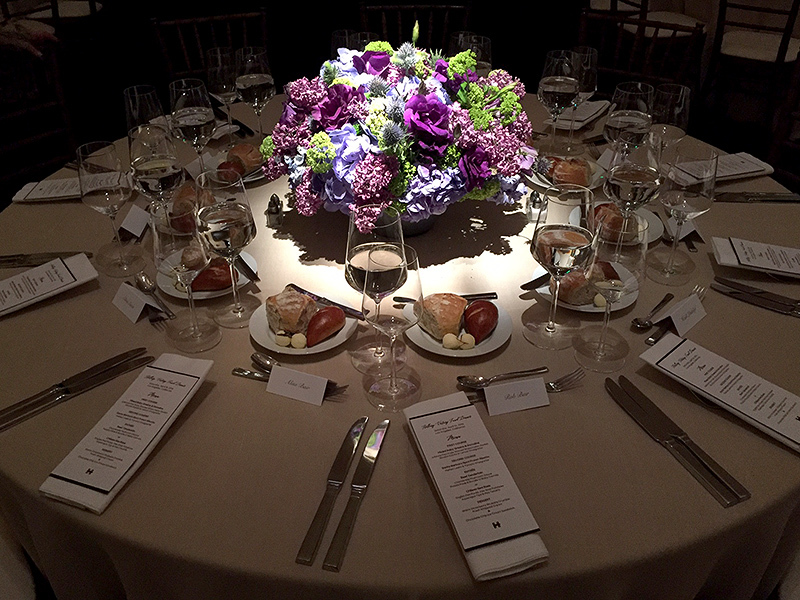 Alisa joked that they figured they'd be seated at the worst table, near the kitchen, so it was a shock to find out, "we would be seated at [Clinton and the Clooneys'] table, all three of them." "They had this gorgeous tent. George stood up to speak. People, all they think about him is Sexiest Man Alive, but he really cares about human rights." After Clooney addressed the crowd, Clinton took the podium and even introduced the contest winners by name. "And the place applauds, just like they do for the Clooneys!" says Rob with a laugh. "It was mind-blowing. I looked up from my meal at George and Amal and Hillary and thought, holy cow, I am sitting across from these people. I'm eating my salad with them," says Alisa. "But at the same time, it was amazing how at home we felt," says Rob. "They made us feel so much at home." "I think Hillary moved to the other table at one point with the other winner. 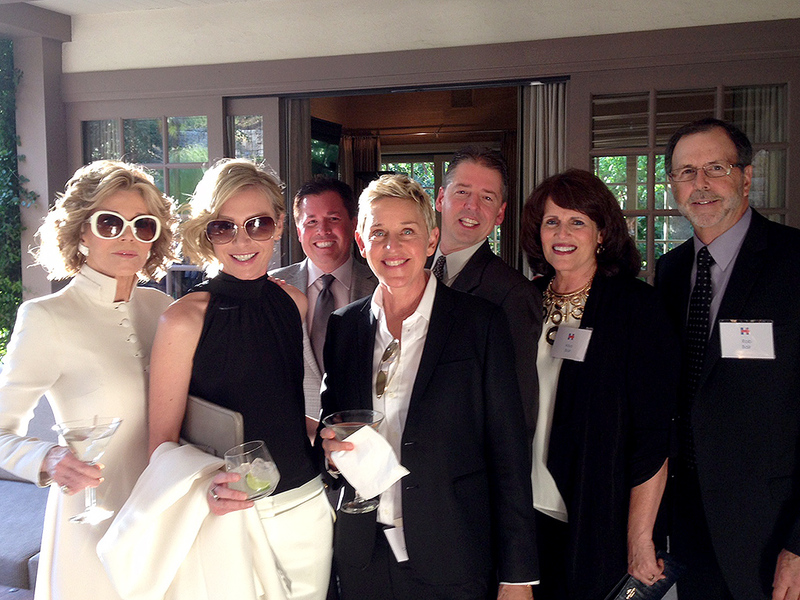 And she's such good friends with Ellen [DeGeneres], she was talking to her quite a bit. She made fun of how Ellen makes her dance on her show and she's not very good." 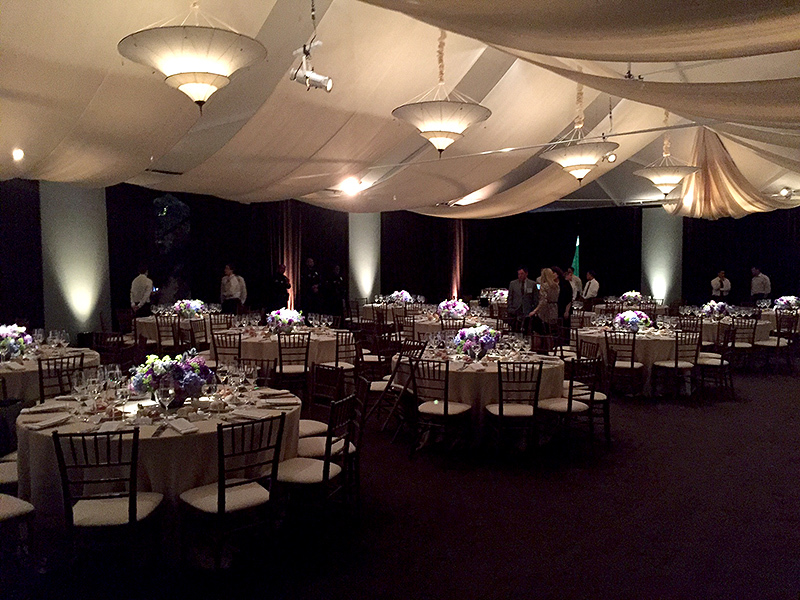 Approximately 150 guests were served a salad, followed by Santa Barbara spot prawn risotto and a choice of beef tenderloin or Chilean sea bass. "Very tasty," sums up Rob. "We were surprised that they never got around to officially serving the dessert." (Warm strawberry rhubarb crumble and chocolate chip ice cream sandwiches were on the menu.) He adds with a laugh, "Maybe that group doesn't eat desserts." Asked about Clinton's chances for the White House, both Alisa and Rob say they believe she could win. And she left a good final impression with the couple. "She comes off the podium in the center of this huge tent, shaking a few people's hands, including ours," says Alisa. 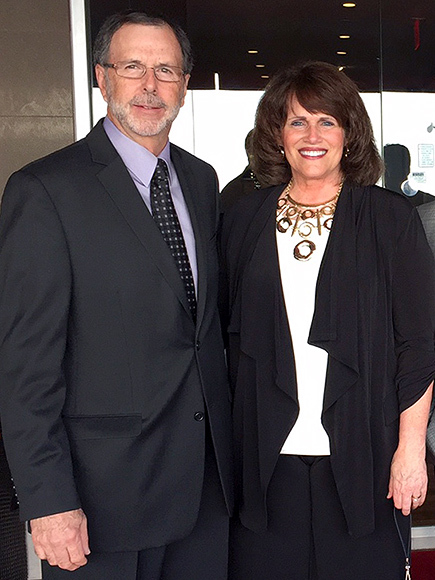 "She came back a step or two to shake our hands, " adds Rob. "I never felt so special being normal." "This is beyond winning a prize," concludes Alisa. "It's feeling lifted up." Very nice! What an unforgettable evening for the winners. Really liked Amal's dress too. I would have insisted on my dessert. How could they forget the dessert? I think the caterers probably got an earful about that. I want to look like Jane Fonda when I grow up. Now that is beauty and grace in your seventies. IMHO.